In November, support candidates who support the “H!” Look for “Your Vote Matters,” MHA’s awareness campaign, to encourage voters to learn where candidates stand on health care issues. Comments are due Tuesday, Sept. 6, on the outpatient PPS and physician fee schedule final rules. MHA’s letter will be posted this week and shared in MHA Today. 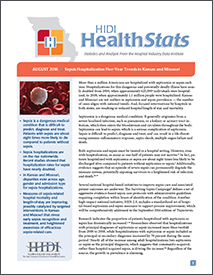 The August edition of HIDI HealthStats explores the prevalence of septicemia and sepsis in Missouri and Kansas hospitals. Increasing awareness of sepsis care, and early recognition and intervention, are contributing to better treatment and outcomes. MHA and the Kansas Healthcare Collaborative currently are leading statewide sepsis prevention projects through the American Hospital Association/Health Research and Educational Trust Hospital Engagement Network (HEN 2.0). MHA has developed and led an immersion project designed to improve sepsis recognition, process standardization and prompt interventions through evidence-based practices. The immersion project offers a 12-month structured framework with quarterly tasks for participants to complete, leading to earlier recognition and intervention of sepsis. In addition, select Kansas hospitals have been involved in the Kansas Sepsis Project, which was launched in 2009 by the University of Kansas and the Midwest Critical Care Collaborative. Although sepsis prevalence is on the rise nationwide, the duration of sepsis hospitalization and sepsis-related mortality in hospitals are declining in Kansas and Missouri. The Centers for Disease Control and Prevention suggests that this sustained surge in prevalence could be due to the advancing average age of the population, an increased prevalence of chronic illness, heightened awareness and tracking of sepsis by medical professionals, the proliferation of antibiotic-resistant microbes, and rising trends in patients receiving more invasive procedures, immunosuppressive pharmaceuticals, chemotherapy and organ transplantation. Researchers have suggested that the Centers for Medicare & Medicaid Services’ guidance regarding sepsis ICD-9 coding may be unintentionally generating surveillance bias. This may lead to additional cases of less severely ill sepsis patients being identified in recent years, which would tend to have a less burdensome impact on case-mix and a corresponding desirable impact on mortality rates. Alternatively, contributions to this positive change in mortality may be attributable to targeted interventions in Kansas and Missouri within the hospital setting. By prioritizing early recognition of sepsis and expanding awareness of efficacious sepsis care, hospitals may be bending the curve on sepsis patient excess hospitalization and patient mortality. Additional data is needed to estimate the influence that these interventions have on sepsis care and outcomes in Kansas and Missouri. The raw data file for the 2015 annual licensing survey is now available for download by Premier Data Package subscribers on HIDI Analytic Advantage®. The raw data file and Excel-based report generator include all hospital-level public data elements within the 2015 annual licensing survey. The file is located in “Finance and Policy/Premier Data” section with the following file name: MO0000_ASF15-DATA.zip. Hospitals interested in subscribing to the HIDI Premier Data Package should review the package information. Current subscribers with questions about downloading files should contact HIDI. An outreach and education webinar for participants in the Hospital Inpatient Quality Reporting Program and Medicare Electronic Health Record Incentive Program is scheduled at 1 p.m. Monday, Sept. 12. The webinar, titled “FY 2017 IPPS Final Rule: IQR-EHR Incentive Program Requirements,” will provide participants with an overview of the final rule as it relates to the alignment of the hospital IQR Program and the Medicare EHR Incentive Program for hospitals. Registration is required. In 2012, nearly 28,000 newborns in the U.S. were treated for opioid withdrawal. That is one infant every 19 minutes.